I think there has always been something about oceans, seas, and deep-water lakes that have fascinated humanity with their mystery. It’s like having (literally) an unfathomable alien world living right next to us, and for the ancients this was an alternate universe of sorts, complete with it’s own population of strange (and therefore dangerous) creatures. Ruler Naharu on the forehead. sets about finishing Ruler Naharu off . . . Mighty Baʿlu disperses him . . .
CTA 2, William W. Hallo and K. Lawson Younger Jr., eds. Canonical Compositions from the Biblical World. vol. 1 of The Context of Scripture. Accordance electronic ed. (Leiden: Brill, 2003), 249. At other times the depths of seas and rivers were seen as containing giant creatures (sometimes referred to as dragons or serpents), which caused the raging of the waters, were dangerous to humanity and all of creation, and were only able to be destroyed by a god. Essentially, these creatures were seen as always threatening chaos and destruction for humanity, and therefore needed to either be bounded or destroyed by a greater power (the perfect scenario for a divine-hero story). 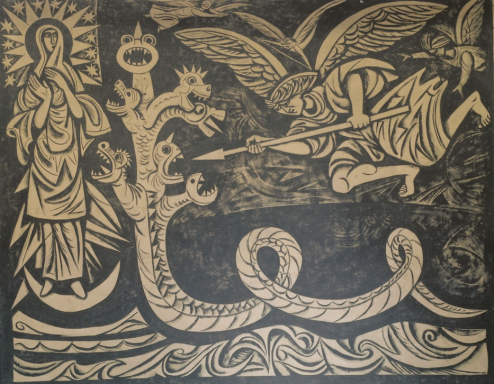 In the Enuma Elish, the Akkadian-Babylonian creation epic, the god Marduk kills the rebellious god-mother Tiamat, creates the vault of heaven and the earth from her remains, and takes his father’s place as the chief of the gods. 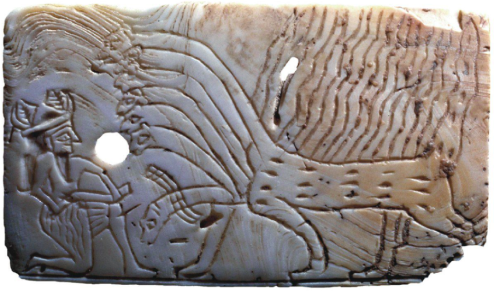 In the Ugaritic myths, Baal also kills the great dragon Lotan (cf. 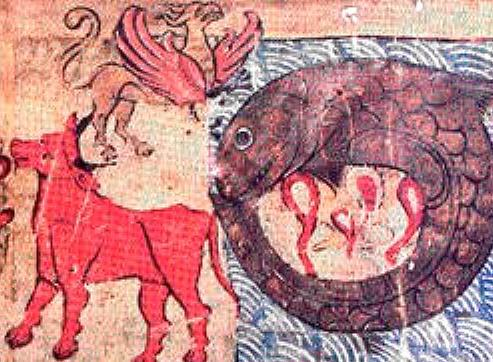 Leviathan in Hebrew) and spreads the remains in the desert, and after overcoming death also becomes the king of the gods in his father’s place. the close-coiling one with seven heads . . .
William W. Hallo and K. Lawson Younger Jr., eds. Canonical Compositions from the Biblical World. vol. 1 of The Context of Scripture. Accordance electronic ed. (Leiden: Brill, 2003), 265. [tanniynim, dragons] on the waters. Seven headed, fiery backed, dragon being fought by a god. “And another sign appeared in heaven: behold, a great red dragon [Greek drakōn, Syriac taniyn], with seven heads and ten horns, and on his heads seven diadems. A depiction of the seven headed dragon from the Book of Revelation. In this scenario the dragon/serpent Satan is cast to earth from the heavens rather than living in the depth of the seas. This beast is defeated by Michael (who’s name in Hebrew means “who is like God?”), is bound and cast into the pit for a thousand years, and then after a period of release is ultimately cast into the Lake of Fire. Said Rabbi Judah said Rab, “Whatever the Holy One, blessed be He, created in his world did he create male and female, and so, too, Leviathan the slant serpent and Leviathan the tortuous serpent he created male and female, and if they had mated with one another, they would have destroyed the whole world. What did the Holy One, blessed be He, do? He castrated the male and killed the female and salted it for the righteous in the world to come: ‘And he will slay the dragon that is in the sea’ (quoting Isa. 27: 1). Ziz of the air, Behemoth of the land, and Leviathan of the sea. Rabbah said Rabbi Yohanan said, “The Holy One, blessed be He, is destined to make a banquet for the righteous out of the meat of Leviathan: ‘Companions will make a banquet of it’ (Job. 40:30). The meaning of ‘banquet’ derives from the usage of the same word in the verse, ‘And he prepared for them a great banquet and they ate and drank’ (2Ki. 6:23) . . .
Rabbah said Rabbi Yohanan said, “The Holy One, blessed be He, is destined to make a tabernacle for the righteous out of the hide of Leviathan: ‘Can you fill tabernacles with his skin’ (Job. 40:31). If someone has sufficient merit, a tabernacle is made for him; if he does not have sufficient merit, a mere shade is made for him: ‘And his head with a fish covering’ (Job. 40:31). If someone has sufficient merit, a shade is made for him, if not, then a mere necklace is made for him: ‘And necklaces about your neck’ (Pro. 1: 9). If someone has sufficient merit, a necklace is made for him; if not, then an amulet: ‘And you will bind him for your maidens’ (Job. 40:29). Perhaps one of the connections with aliens is that space itself has become the new “Deep” or “Abyss” that is unfathomable to us. 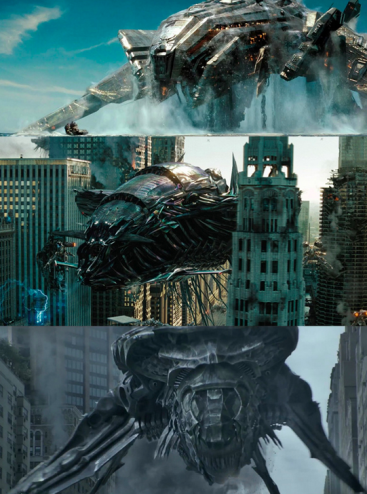 The Avengers is an example of a modern combination of all of these historical and modern motifs: mechanized dragons of chaos coming from the ancient depths of space, destroying a humanity that is defenseless against their power, and only super heroes (gods?) can defeat them and restore order. Interestingly, the divine hero who ultimately defeats these creatures isn’t even Thor, who is a god, but it is the scientist/inventor Tony Stark.